Dramatic, desperate, or maybe both? To get the final 32 units sold at the 550 Vanderbilt condominium in Brooklyn, developed by Greenland Forest City Partners, uber-broker Ryan Serhant, of Million Dollar Listing fame, has alerted real estate brokers to a flash sale. “On this Sunday (December 2nd) we will have a 1-day, 20% OFF SALE from 11am – 4pm,” Serhant wrote in a message to brokers this week, inviting potential buyers in for previews. “Happy Bidding :)” The building, which has 278 units, has faced a roller-coaster ride of sales, strategies, and even a Million Dollar Listing episode in the last three years. If the flash sale might seem a stunt—would they really decline to offer discounts later?—a citywide slowdown in condo sales reflects a clear buyer’s market. Recent quarterly reports by the real estate brokerages Corcoran and Stribling indicated sales slowing in pricier parts of Brooklyn. Warburg Realty cited “[o]ffers 20% and 25% below asking prices … a phenomenon last seen in 2009,” though it suggested Brooklyn sales at prices below $2 million were reasonably healthy. The competition among discounted condos in the city is mounting. The Real Deal just reported that Extell Development will pay three years’ of common charges for one- and two-bedroom condos that go into contract by year’s end, and five years of common charges for larger units. That includes buildings like One Manhattan Square, which looms to Brooklyn viewers over the Manhattan Bridge, and Brooklyn Point, part of the City Point development in Downtown Brooklyn. Other developers, according to the Real Deal, will pay closing costs or offer rebates on commissions. Especially choice units can be a tough sell. For example, the penthouse at 1 Main Street in Dumbo went to market in 2011 at an astonishing $23.5 million, then saw its price dropped to $19 million after 18 months, according to StreetEasy. The unit resurfaced at $10.1 million in September, but five weeks later the price dipped to $9.75 million. Buyers have become skittish, according to Bisnow and the Wall Street Journal, because of rising interest rates, the loss of tax deductibility, and a volatile stock market. Some sellers, Bisnow reported in August, are under pressure from investment partners to move product. In certain cases, at least when there’s significant inventory, the developer aims to maintain the unit’s sticker price, so as not to hamper future sales, or antagonize previous buyers concerned about resale value. At 550 Vanderbilt, the only condo building in the Pacific Park (formerly Atlantic Yards) development, that doesn’t seem an issue. While developer Greenland Forest City Partners declined to elaborate on the rationale for the 550 Vanderbilt sale, some significant savings might be had this Sunday, given that several larger units remain, notably two penthouses, listed for $6.86 million and $7.715 million. Most units listed on 550 Vanderbilt’s StreetEasy page are two bedrooms or bigger, reflecting that it has been easier to sell smaller, less expensive units. Though StreetEasy doesn’t list all 32 condos, the 13 units listed for sale two days ago had a cumulative price tag of $41.3 million, while seven others said to be in contract had cumulative list prices of $11.5 million. Add 12 more units to reach the total of 32 said to be on sale, and it’s possible the potential sell-through exceeds $70 million, at least if list prices are met, or $56 million at a 20% discount. The building’s cumulative offering price is $391.2 million, according to the most recent amendment to the offering plan. The developer, which quickly sold a first tranche of units in China—lead partner Greenland USA’s parent company is in Shanghai—ultimately nudged up prices from a cumulative $388.57 million at the start. It’s possible 550 Vanderbilt was priced aggressively high, given its current setting. Though Serhant’s website page for the tower touts it as offering “the inaugural opportunity to live and own in New York’s newest park,” 550 Vanderbilt will be bordered by construction sites for years, and Pacific Park’s eight acres of open space, along with the full complement of towers, isn’t projected for completion until 2035. While previous sales averaged $1,460 per sq. ft., according to StreetEasy, active sales—which include rare penthouses and maisonettes—are priced at $1,658 per sq. ft., at least before the discount. Brooklyn Point also has high prices for the borough; sales average $1,797 per sq. ft., according to StreetEasy, while other Downtown Brooklyn condos cost less, with 11 Hoyt listed as asking $1,575 per sq. ft., The Brooklyn Grove at $1,373 per sq. ft., and 211 Schermerhorn at $1,380 per sq. ft. Along the way, sales at 550 Vanderbilt have failed to match the fanfare. In a July 2015 Real Deal article about the seeming lack of condo inventory in Brooklyn, an executive for brokerage firm Citi Habitats predicted that the building would be sold out by the end of 2016, in time for move-ins. In September 2015, when the developers opened a sales gallery in Brooklyn, they declared that 80 units had gone into contract thanks to pre-sales, which turned out to rely significantly on marketing in China. In July 2016, the Real Deal reported that the Greenland Forest City claimed the building was 50% sold, with more than 140 units in contract. But that masked relatively slow progress in closing deals since the September 2015 sales gallery. By mid 2016, based on that pace, it looked like the sell-through could last 20 months, through early 2018. Forest City, which had launched Atlantic Yards in 2003 and partnered with Greenland in 2014 at a 30% share to build three towers, began winding down its role. It sold the only tower it built solo, and then this year sold all but 5% of the project going forward to Greenland. Meanwhile, the joint venture made changes in the sales effort at 550 Vanderbilt. In July 2017, it swapped broker Corcoran Sunshine for Serhant’s Nest Seekers International, claiming to the Real Deal that they wouldn’t cut prices. However, as reported later, that swap was coupled with an undisclosed maneuver that lowered taxes significantly on higher-end units, effectively reducing the cost of ownership. (Both NestSeekers and developer misleadingly advertised taxes for some units at a bizarre $1.) By December 2017, the developer also began lowering prices on select units. By some measures, the building’s sales performance looked good. For 2017, 550 Vanderbilt was the second-best selling building in the city, according to Property Shark, with 173 units sold. Then again, that encompassed numerous units that had gone to contract earlier, including with those 2015 Chinese buyers, many of whom sought investor units. Indeed, Bloomberg last June reported that 550 Vanderbilt, with 41% of its units sold in 2017 up for rent, was the the city’s most popular building for investor condos. And sales apparently slowed. In October, the Wall Street Journal reported, citing “people familiar with the matter,” that Greenland had underestimated the time it would take to sell condos in New York and in its Los Angeles developments. Also, as reported for The Bridge in October, a Million Dollar Listing episode portrayed Serhant as having made a Hail Mary pitch—a community smorgasbord—to win the job in 2017 as exclusive broker for 550 Vanderbilt, though the record showed he had already won the job. Nor did the sticker prices shown during that episode screen reflect what buyers at the event would have been told. Three of the five “list prices” reflected price cuts announced long after Serhant’s big event. 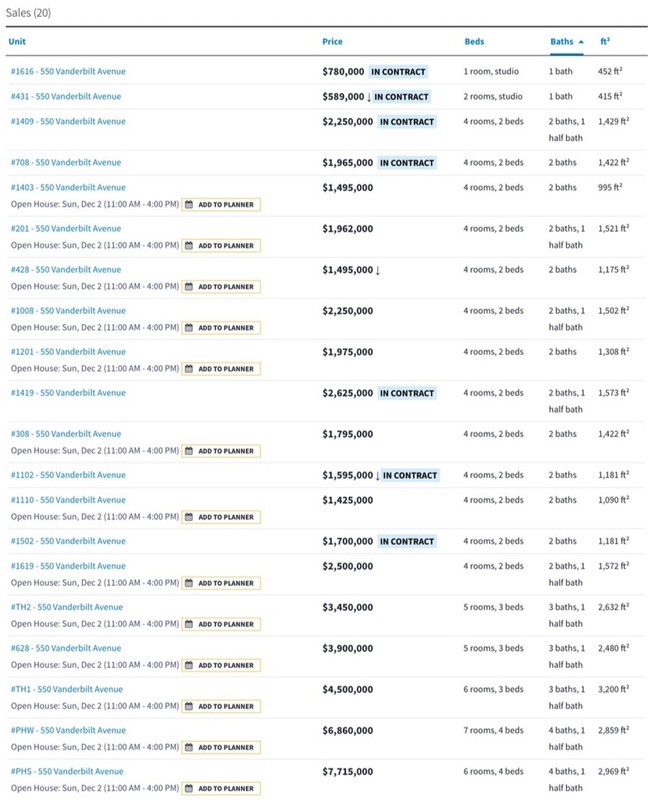 As noted, that allowed Million Dollar Listing to portray Serhant as closing deals not far off list price. That strategy, apparently, has been abandoned.